On the next to last evening of a week long continuing education in the Blue Ridge Mountains of North Carolina I received a gift that took my breath away and brought a tear to my eye. A member of my group of four called me over. She was sitting on a church pew with her husband who was recovering from extensive brain surgery. 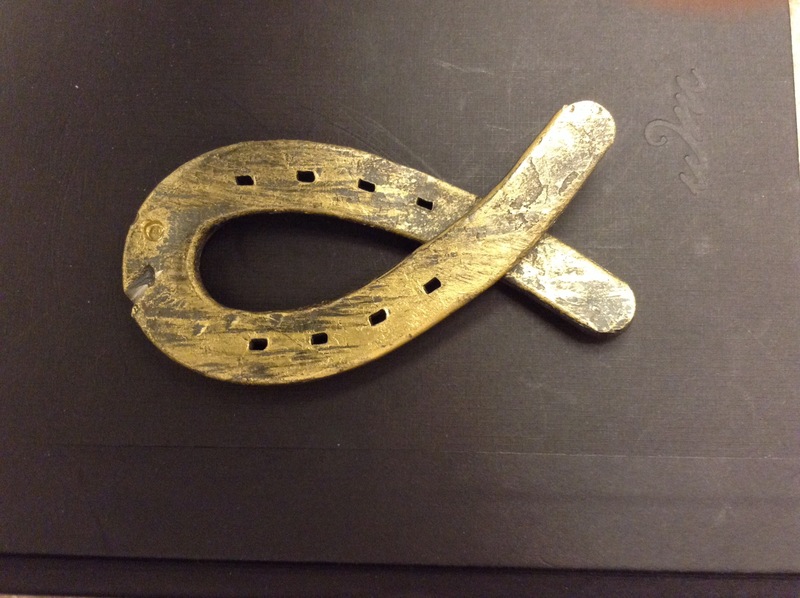 Standing in front of them, her husband reached into his pocket and handed me a horse shoe in the shape of a fish, an early symbol used by followers of Jesus to identify one another. Before his surgery he had been a blacksmith, skilled in all aspects of the art of “smithing.” It had been two years since he worked although anvil and hammer, forge and fire. A local smith let him use his shop that afternoon where he made two fish from two horseshoes. And he gave one to me! Why, I wondered. We had shared a meal, some conversation and laughter–every day activities hardly worthy of such a gift. But therein lies the glimpse, the gift in spite of my unworthiness. The gift was nothing short of an act of grace. Amazing grace that comes to us not because we are worthy of the gift, but because the giver simply wishes to give it! For God so love the world that He gave…(John 3:16a), not because of who we are or what we have done but because God simply wishes to give, unconditionally. And when we receive the gift, truly receive it, we do so in total humility. Lord God, give me a heart that is truly humbled by Your grace, Your love that knows no bounds. Amen. You are certainly worthy, and I was happy to give it to you. I am blessed to be given the opportunity and to share my work with someone who will enjoy it. If you ever come our way, please join us for a meal. I’m pretty a good cook. In fact, it may be why Stacy married me.